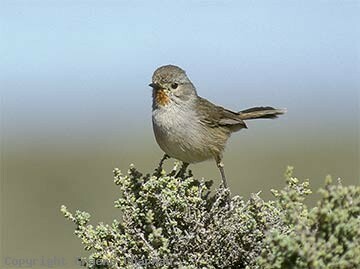 Redthroats are shy little birds. They spend most of their time on or near the ground in the shrublands of the arid zone from near the Darling River in NSW right across to the west coast of Western Australia. East of the Darling River in eastern Australia they are replaced by their close relative, the Speckled Warbler. 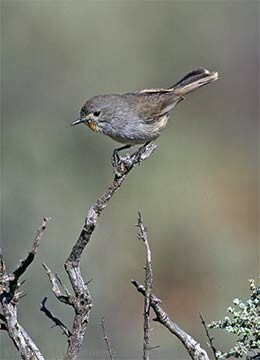 Redthroats occur in a variety of habitats - in N.S.W and S.A. open saltbush country (shrub steppe, pic 497204) is favoured. They are fairly easy to find around the outskirts of Broken Hill. In southern Queensland they are known as far east as Cunnamulla (Bowra Station) and Mariala National Park near Charleville. 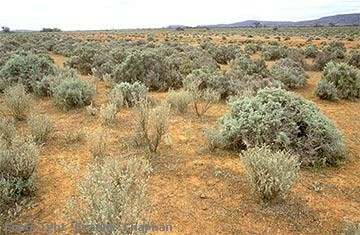 At Mariala, they inhabit a dense sub-shrub layer of Eremophila in mulga country. Further north, they occur in similar mulga country on stony ranges almost as far as Winton. At Port Augusta in S.A. you can see them at the Arid Lands Botanic Garden on the edge of town. In W.A. they occur over a wide range of mulga and other Acacia scrubs and also in mallee, but always where there is a well-developed shrub layer. The varied almost canary-like songs of the males will always attract attention, but females and young ones are more seldom seen - they are amongst the plainest of all of our small birds - virtually all grey, just a bit paler on the throat. A useful field indicator is that, when disturbed, Redthroats fly off with a distinctive whirr of wings. So do Speckled Warblers. Like Speckled Warblers, they build their nests on or near the ground, sometimes in a slight depression so that the small entrance hole is the only visible clue. The two species also lay quite dark coloured eggs (see 497203 and 504204) and are both often hosts to the bronze-cuckoo of the inland, Black-eared Cuckoo. 497201 ... Redthroat, adult male. 497202 ... Redthroat, adult male. 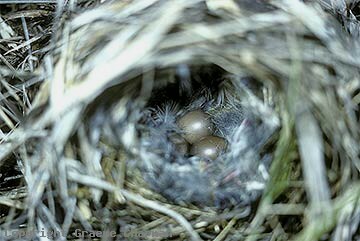 497203 ... Redthroat eggs are dark in colour - compare their close relative the Speckled Warbler. 497204 ... Saltbush/bluebush shrubland near Iron Knob S.A., ideal Redthroat habitat.